I am so happy it's Friday! I had my last observation yesterday for the year (we have 4 total and 3 of mine have been in the last three weeks!). Today after work I need to finish getting prepped because I have my Card Club from 6-8:30pm! It's a Fab Friday and we have a sketch for you today! 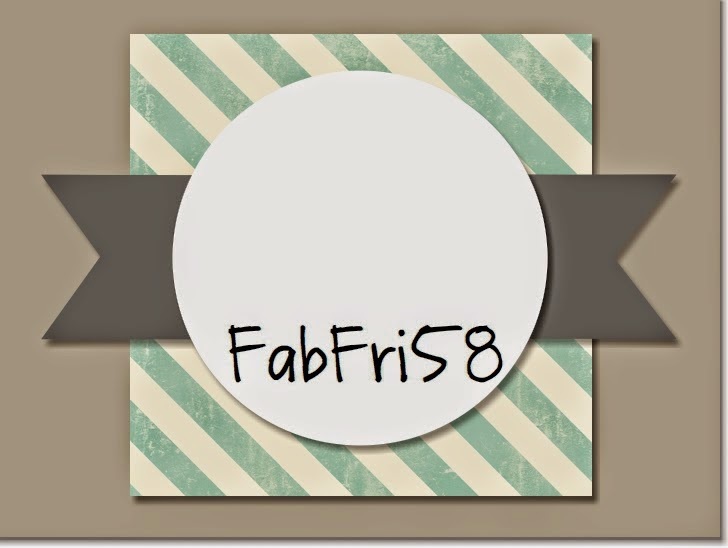 Click picture to take you to the Fab Friday page and check out what the other designers created. 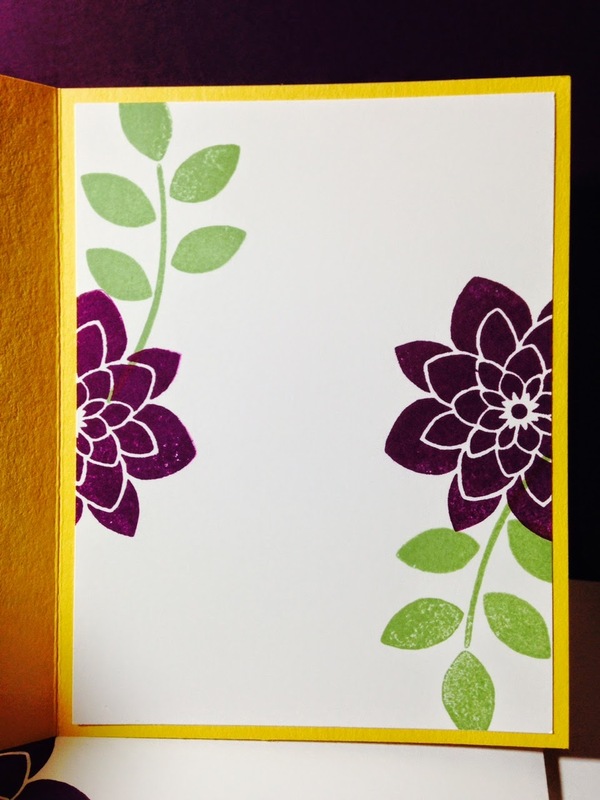 I grabbed the Painted Blooms Designer Series Paper and pulled coordinating card stock colors. I used: Daffodil Delight, Blackberry Bliss and Wild Wasabi. 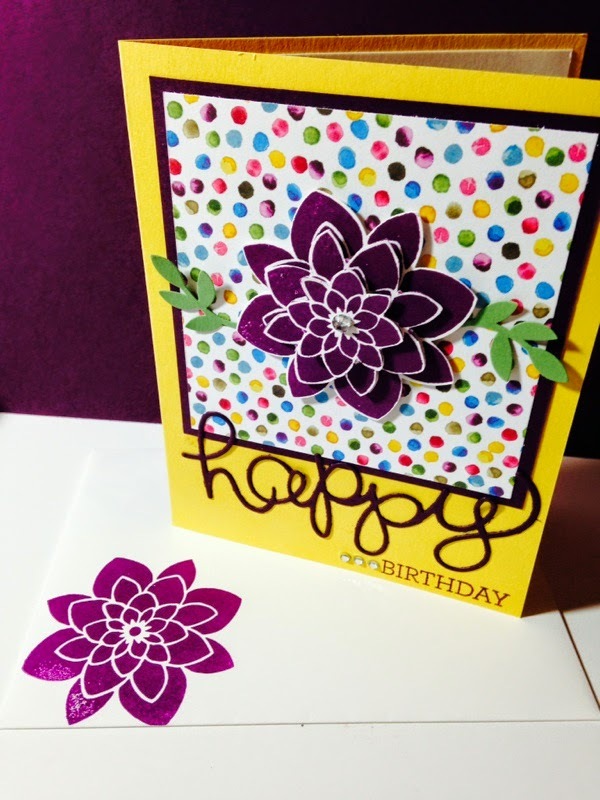 To create the triple layered flower I stamped it three times! I punched the main flower using the Flower Medallion Punch. Then I fussy cut the two smaller flowers. 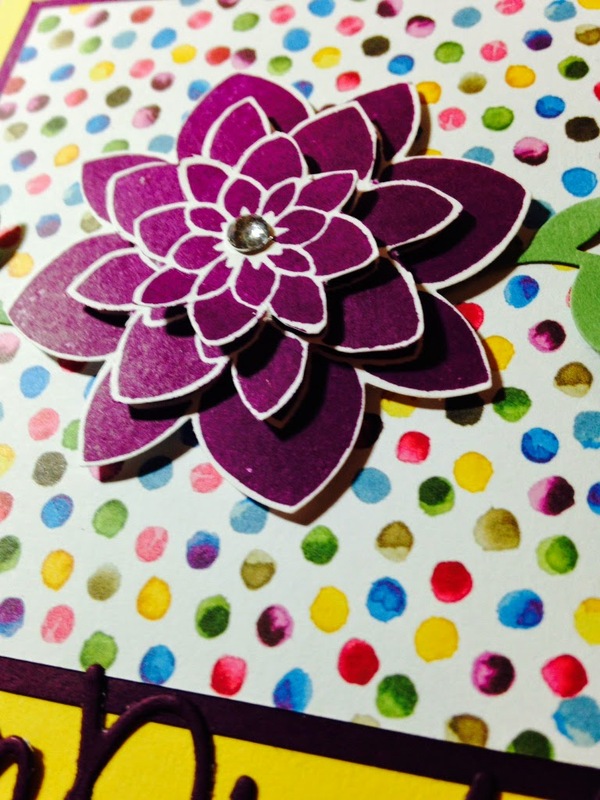 Technically you could make this a four layer flower but in all honesty, I don't have the patience for lots of fussy cutting (that's why I own every punch and framelit). Lately I have been really into making coordinating insides of my cards. One, they are just super prettier but two, it makes the entire project flow. From the beginning when I am cutting card stock, I cut a piece for the inside and "try" to remember to stamp when I am stamping the front. In all honesty, most of the time I have cleaned the stamps and have to re-ink but the idea is to do the front, inside and envelope all at the same time! Speaking of envelope, here's the coordinating envelope for this project. Doesn't it all come together so nicely? I forgot to mention the Crazy About You Bundle! It comes with TONS of words to make up sayings to suit your needs! 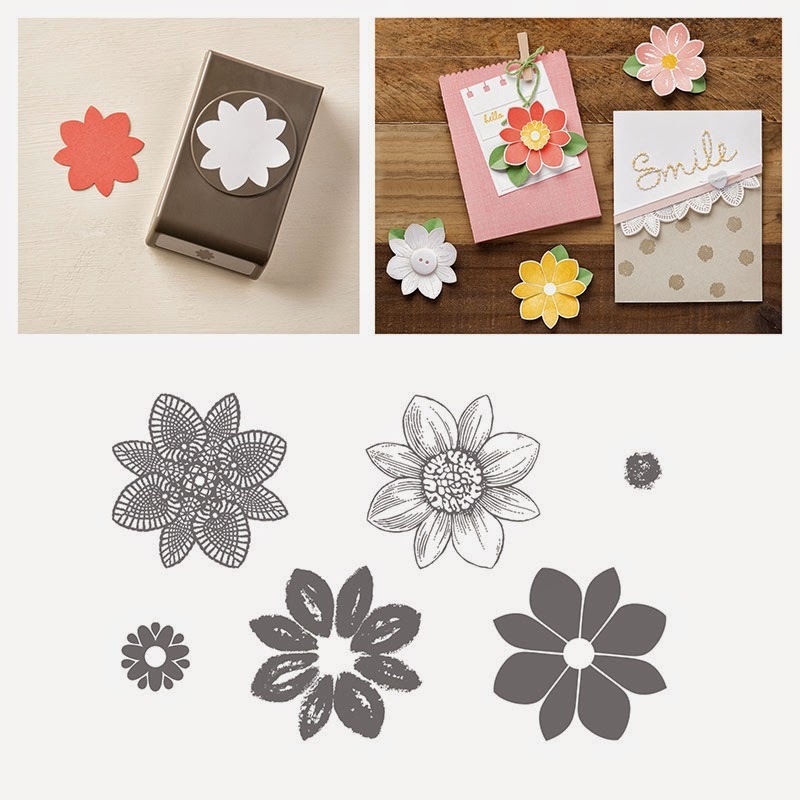 It's a great bundle and when you buy the stamp set and thinlits together - you get 15% off! It coordinates with three of our punches too! Check out the picture below! What a perfect sunny & cheerful card to start this cold morning off! I love the bright colors and your layered flower. The leaves a fun way to do the banner element of the sketch! TFS! Love the bright and bold colors in this card! 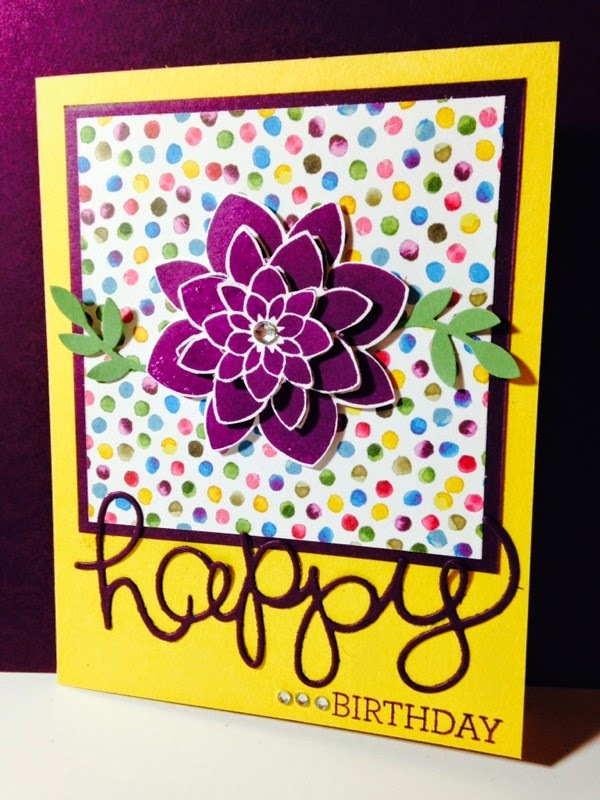 Love these colors - you've picked all my faves to bring together on this cheery card! Great take on the sketch!